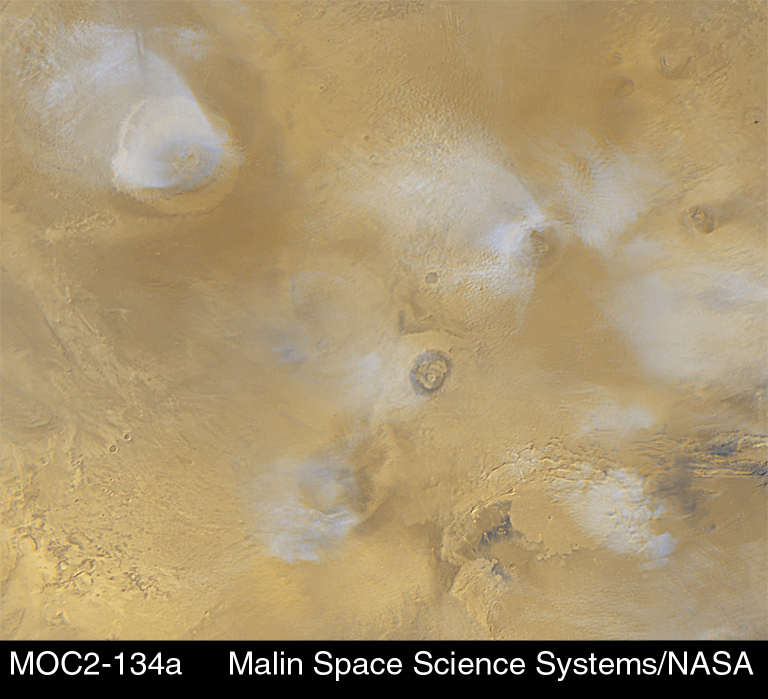 The volcanoes of the Tharsis region are highlighted by this color image mosaic obtained on a single martian afternoon by the Mars Orbiter Camera (MOC) onboard the Mars Global Surveyor (MGS) spacecraft. Olympus Mons dominates the upper left corner--it is one of the largest known volcanoes and is nearly 550 km (340 miles) wide. The grayscale image on the right shows the name of each volcano in the scene. The white or bluish-white features are clouds. Clouds are common over the larger Tharsis volcanoes in mid-afternoon. The four largest volcanoes are more than 15 km (9 mi) high. 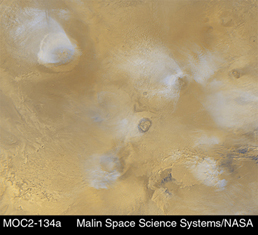 Viewed from Earth by telescope before any spacecraft had visited the planet, astronomers often described a "W-shaped" white cloud over the Tharsis region. This "W" was actually the result of seeing the combined effects of bright clouds hanging over the Ascraeus, Pavonis, Arsia, and Olympus volcanoes. The clouds result when warm air containg water vapor rises up the slopes of each volcano, cools at the higher altitude, and causes the water vapor to freeze and form a cloud of ice crystals. Pavonis Mons lies on the martian equator, north is up, and sunlight is illuminating the scene from the left. The picture is a mosaic of red and blue filter images taken on three consecutive orbits. The slightly blurred appearance of the left side of Arsia Mons results from distortion toward the edges of the images used to make the mosaic. To remove the blurr, an image obtained on another day would be added to the mosaic--however, this image would not match well because the cloud patterns will have changed by the next day. Mosaics such as the one shown here are used to monitor changes in martian weather and to plan future observations.